Before setting sail for the new world, English Pilgrims carefully calculated what items would fit into their trunks. Necessities such as: a Bible, a good knife, some warm winter clothing and a bottle or two of wine, usually a French Bordeaux, were included. Some kind of alcohol was considered a necessity because water had a bad reputation in seventeenth century Europe, where much of the water was polluted. The colonists believed that the same situation existed in the the new world. So, before setting sail they stocked their ships with as much alcohol, of various kinds, as possible. It was not unusual for a Pilgrim ship, setting sail for America, to be stocked with three times as much beer as water, along with several thousand gallons of wine, and whatever hard liquor the passengers packed in their trunks. When these thirsty pioneers reached the Connecticut shores, they were surprised to find that the water was drinkable, and that wild grapes, red and white, thrived throughout their new home territory. As settlements in this state grew, wine made from these wild grapes became a staple beverage. It was presented hot and mulled to preachers during long sermons, given to children as medicine, and often served to funeral home visitors during wakes. This sweet homemade brew sustained many families during the long winter nights. As the 17th century advanced, the popularity of wine was challenged by a variety of other beverages. Shiploads of rum from the West Indies, along with a variety of wines from France appeared. As apple orchards were flourishing, families began drinking hard apple cider with every meal. 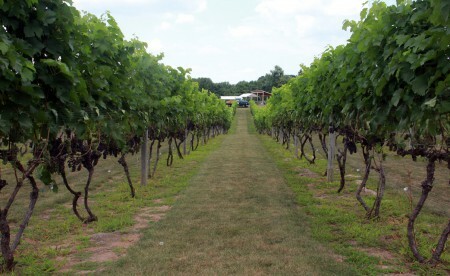 Despite all of this competition, enough people were still growing grapes in large enough quantities to keep the grape culture alive in the state, and new vineyards continued to spring up all over Connecticut. However, the Temperance Movement was slowly gaining influence. Laws were being passed that threatened to kill the retail wine sales that wineries depended on for survival. In 1922, the Eighteenth Amendment and the Volstead Act were passed. These two laws made the production, sale, and distribution of most alcoholic beverages, including wine, illegal in this country. Wine vineyards in Connecticut went into a steep decline and started to vanish from the landscape. 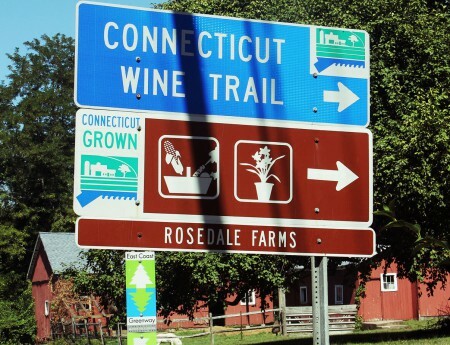 Even after the Eighteenth Amendment was repealed in 1933, local laws in Connecticut made commercial wine making impossible. Finally, in 1978, Governor Ella T. Grasso signed the Farm Wine Act into law, which allowed the production and sale of wine to be legal in this state. By 1979, several vineyards were distilling and selling wine to the public. 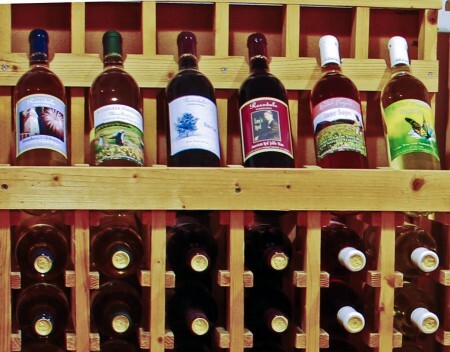 Today, there are about 33 farm wineries in this state. They all produce a variety of distinctive quality wines that have captured the interest of wine lovers here. It is difficult to drive for 45 minutes in any direction in this state without driving by a thriving vineyard. 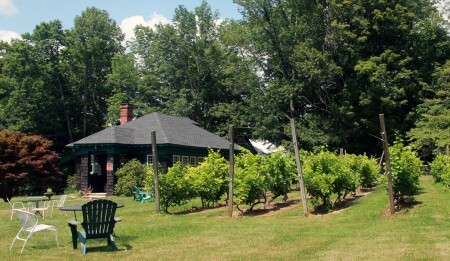 It would not be a stretch to say everyone living in Connecticut has a vineyard in their backyard. Last month, my wife Tricia and I spent a weekend in the Finger Lakes region of New York State, where farm wineries have been thriving for many years. 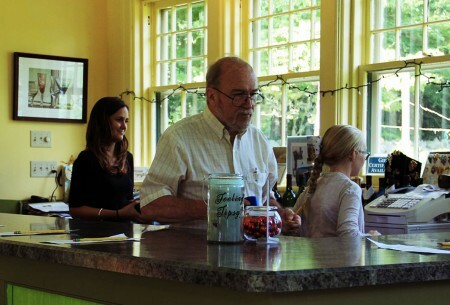 I returned to Connecticut with a renewed interest in local wines, especially those produced by the 33 farm vineyards here in Connecticut. My first choice for a visit to a local vineyard was by chance. I was hiking along the Talcott Mountain Ridge, searching the skies for bald eagles riding the thermals rising up from the valley floor. When I got to the Heublein Tower to the west, I stopped to rest. While panning the valley floor to the east with my binoculars, I caught sight of a large red barn with two fields of grape vines in front of it. I hurried back to my car and headed in that direction. My first visit to a Connecticut farm vineyard had begun. 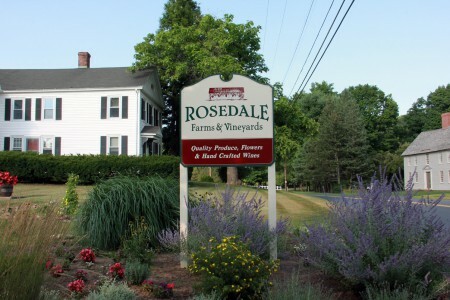 Rosedale Farm and Vineyards is my first stop on the Connecticut Wine Trail. 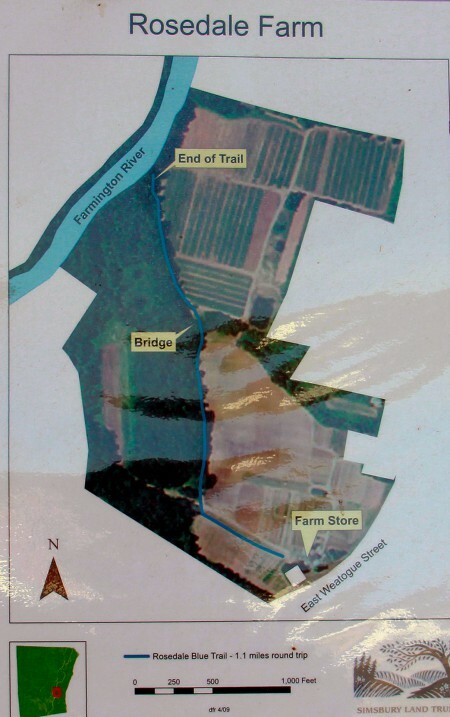 It has been a successful farm since 1920, offering Farmington Valley residents a wide variety of high-quality fresh fruits, vegetables, and flowers. Inspired by a talented and innovative local winemaker with over 20 years of wine making experience, the owners established a four-acre vineyard, accompanied by a wine bar offering free tastings. Their first vintage was available in 2005. Since then their wines have captured medals in several prestigious wine competitions. Their red wines are very popular throughout the valley, so for my first purchase from a Connecticut winery I chose Lou’s Red. This is a medium body red table wine which is juice from Merlot and Marechal Foch grapes. I gave this bottle to my son Michael to taste. He was impressed with how smooth and easy to drink it was. That is a special compliment, especially from a man who favors more robust wines like Zinfandel. The wines in this small section of their wine rack were featured the day I visited. The visitors sampling wine here were also treated to a majestic view of the vineyard and its fruit-heavy vines. 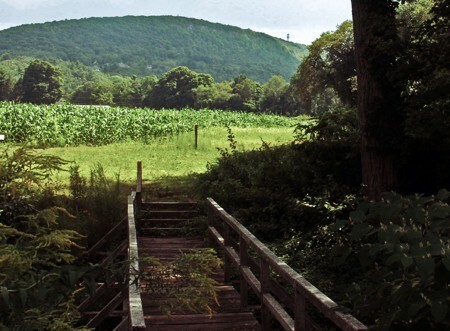 After crossing the bridge indicated on the trail map, I was rewarded with a scenic view of cornfields and Talcott Mountain. 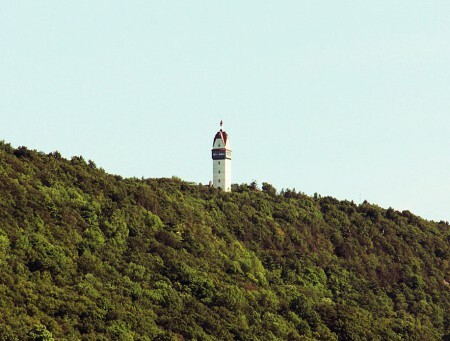 If you look to the right side of the mountain, you will see Heublein Tower. This is the prize for taking this pleasant and short walk on a warm summer afternoon. 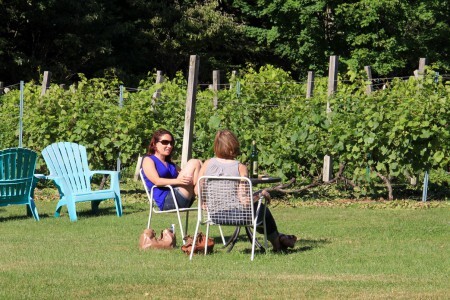 A few days after visiting Rosedale, I headed north to visit a small vineyard in New Hartford. 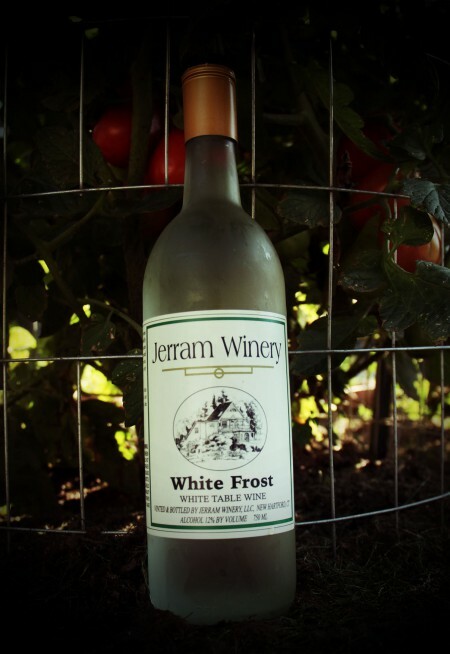 The winery was founded in 1998 and is owned and operated by Jim Jerram, a man with extensive experience in the food and beverage industry. 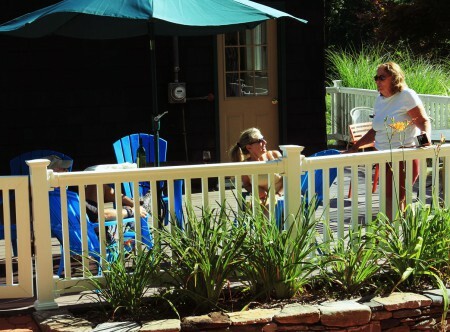 The winery sits close the vineyards and gardens with patios and decks for guests to relax and enjoy a glass of wine on a warm sunny afternoon. I purchased a light and fruity wine made with Chardonnay grapes. 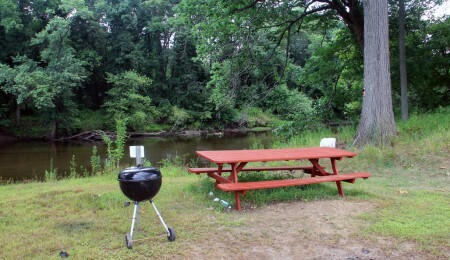 My wife and I enjoyed it with glazed salmon, cooked on the grill that night. The match was perfect, even though it was by chance. The vineyards are alongside the tasting room where guests are invited to sample featured wines. 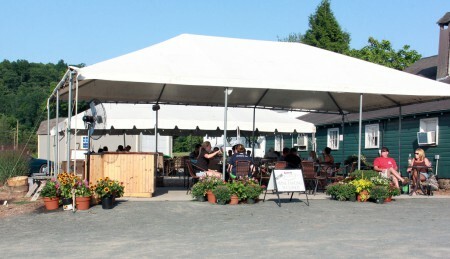 The atmosphere is warm, friendly, and relaxed at this winery. In the photo above my wife is having a conversation with a couple that live in the valley a few miles from us. 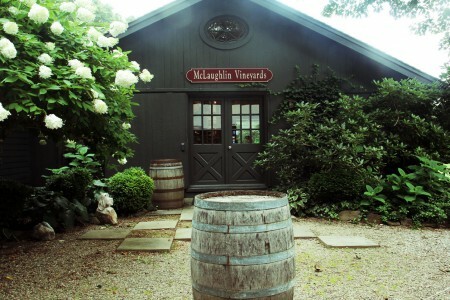 McLaughlin Vineyards is a family owned and operated vineyard located on a 160-acre farm in Sandy Hook, Connecticut. 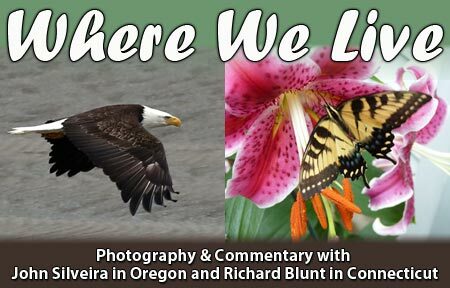 The farm shares land with the Upper Paugussett State Forest where bald eagles can be sighted on a cold winter day. This was one of the first farms to establish a winery after the state made it legal to make wine commercially. This vineyard produces over 2,500 cases of grapes from about 15 acres of vines. My visit was prompted by more than an opportunity to tour the winery and vineyards. 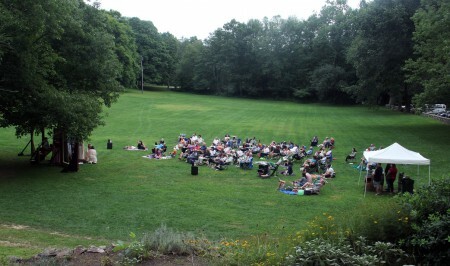 My son Michael is a member of a professional theater group that tours New England performing the works of Shakespeare. 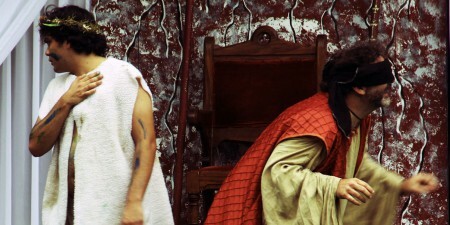 On this day, the group was presenting the tragedy King Lear at the vineyard. Michael portrays the rich and clueless son of Gloucester, one of the kingdom’s most powerful men. Edgar survives being convicted of plotting to kill his father by disguising himself as Tom O’Bedlam, a crazy man who wanders around begging for food. 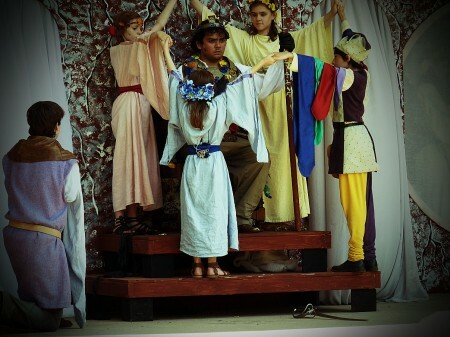 Near the end of the play, Edgar is crowned King. 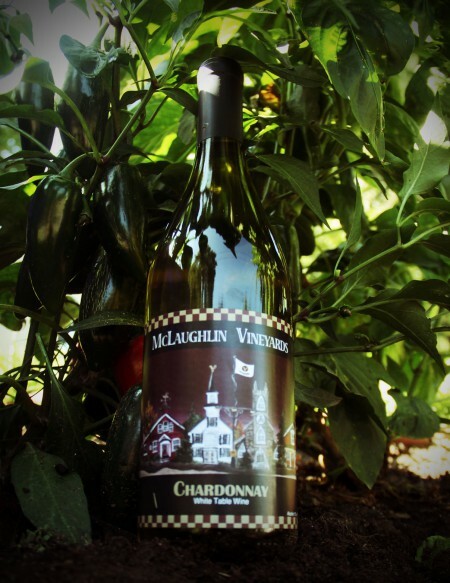 This light and fruity Chardonnay was a featured wine on the day of my visit. The vines in this photo are part of an experiment to produce organic grapes. The 2nd Annual Connecticut Wine Festival will be celebrated at the Durham State Fair later this month. In attendance will be seven of the state’s established wineries. We will also be there to record and share the excitement with you.